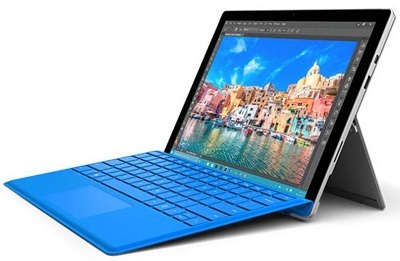 With the new Microsoft Surface Pro 4, the stylus and the TypeCover were fundamentally revised in addition to the tablet. We test the execution with 256GB SSD, 8GB RAM, and Intel i5 processor and deliver you in addition to all technical data our full review. The Microsoft Surface Pro series has gotten a successor and Microsoft brings with the Surface Pro 4 a really good continuation of the product line in the market. Externally you can hardly see any difference to the predecessor, the Surface Pro 3, but hardware has changed a lot. The Surface Pro 4 comes in different variants, so there is something for every application. The Microsoft Surface Pro 4 has a 12.3-inch display with a display format of 3: 2, although the outside dimensions are not grown compared to the Surface Pro 3. Logically so that the display edge has shrunk slightly. This is also recognizable by the fact that there is no Windows button on the front. This one was removed completely. The resolution of the display is 2736 x 1824 pixels, resulting in a pixel density of 267 PPI. 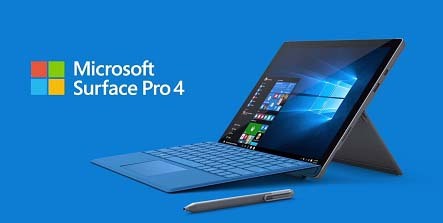 The Surface Pro 4 is powered by an Intel processor of the latest generation (Skylake), whereby one can fall back depending on the variant on a Core m3, i5 or an i7. Our test copy is equipped with an Intel Core i5. This offers a clock frequency of 2.4 GHz and can fall back in turbo boost to up to 3.0 GHz. There are 8 GB of RAM available in this variant, and the built-in SSD has 256 GB. You can find the other equipment variants in the table below (Variants Surface Pro 4). As mentioned in the introduction, the Surface Pro 4 is hard to distinguish from the Surface Pro 3 at first glance. Microsoft relies here on the already proven design of its predecessor. Nevertheless, a few subtleties can be distinguished at a second glance. So the Surface Pro 4 has become a little thinner because the tablet now measures only 8.45 millimeters in depth (Surface Pro 3: 9.1 millimeters). Connections on the Surface Pro 4 are a full-fledged USB 3.0 port, a Mini DisplayPort, the cover connector, as well as a 3.5-millimeter headset jack and a microSD card reader available. 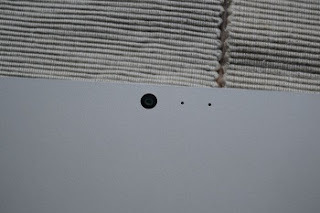 We still miss a SIM card slot, which was already required by some users on the Surface Pro 3. Again, there are no significant differences to the predecessor. For wireless connectivity, the Surface Pro 4 has Bluetooth 4.0, 802.11ac WLAN, and Miracast. However, the arrangement of the connections has changed a little bit. So also with the hardware buttons on the edge of the case. The volume rocker is no longer sitting on the side of the tablet but can be found on the top of the case, next to the power button. This has the advantage that the volume control, especially with angled headset plugs, (literally) nothing stands in the way. In the field of cameras, Microsoft has done something, because the back camera now offers 8 megapixels (in comparison: Surface Pro 3: 5 megapixels). However, the resolution of the front camera has not changed. Here, Microsoft continues to rely on a 5-megapixel camera, but this should be enough for the usual use cases (video call or fast selfies). A major innovation is an infrared camera, which provides a new variant of user authentication in the context of Windows Hello. Once set up, it is enough to sit in front of the Surface Pro 4 and unlock the device with a smile. If you use the Surface Pro 4 with the accessories, such as the stylus and the TypeCover, the first really big differences become apparent. The new pen, which has been completely redesigned, now offers increased pressure sensitivity. Furthermore, the appearance has been revised. So the Surface Pro 4 Stylus now has a flattened side, on which a long magnetic strip, which also acts as a button, can be found. This magnetic strip allows the pen to be attached even better to the Surface Pro 4. In its predecessor, the Surface Pro 3, the storage of the pen was still solved by a loop that was attached to the cover. Although it was also possible to attach the pen magnetically to the power port, this was more of a stopgap than a deliberate storage option. Furthermore, the stylus has become a little bit longer. The second button on the side of the pen that switched to eraser mode when writing has been relocated. Thus, the button on the top, which previously had only the function to open OneNote, or to create a screenshot, can also be used as an eraser - almost like a real pencil. The TypeCover has also been redesigned and comes with a new chiclet design. For newcomers to the Surface Pro 3, this may seem a bit strange, but you get used to the new layout quite quickly. The writing on the new TypeCover works very well, the keys are big enough, even though the cover as a whole is not up to it. Even the pressure points are pretty good for such a narrow keyboard. I wrote this review here on the new TypeCover, as it is fully compatible with the Surface Pro 3 and was based on such a good test scenario. Another clear advantage is the new touchpad. This has not only gotten bigger but also made of glass. It now measures about 10 x 5.3 inches, which is the size of a credit card + 1.5 centimeters in length. This means swiping gestures are even faster and more precise from the hand since there is hardly any noticeable resistance when using the touchpad. The Microsoft Surface Pro 4 comes with preinstalled Windows 10 Pro. On our test copy, however, was not the fall update, ie the Build 10586, installed, so an update after startup was not lacking. Furthermore, from 18.11.2015, a system update for the Surface Pro 4 distributed, which should raise the performance of the processor again something. Because since the autumn update, the processor reacts now, no longer regulated by the operating system, flexible to the computing load and adjusts the clock rate accordingly. Ergo follows from this an increased efficiency and optimized performance of the overall system. This feature is called Speed-Shift technology. New to the Surface Pro 4 is the authentication via Windows Hello, I have just considered this point in the camera to perform, but think that he fits better at the software site. Windows Hello allows you to unlock the Microsoft Surface Pro 4 through various ways, via biometric data. The Surface Pro 4 offers here an infrared camera via which the tablet recognizes the user and Windows is automatically unlocked. The whole thing works so well, that after the trial I have a hard time entering the PIN on my Surface Pro 3. One is almost spoiled by the new possibility. In addition, a TypeCover with fingerprint scanner came on the market in the USA, but we do not have to do that in Germany at the moment, but maybe Microsoft in this country will fulfill our wish and bring the TypeCover with a fingerprint scanner to Germany. But here it's time to wait. In the design of the Surface Pro 4, Microsoft remains true to its own line. The new power tablet from Redmond comes again in a magnesium housing. This gives the tablet the necessary premium effect, because it not only looks high-quality, it also feels that way. Through the mentioned material, Microsoft also secures the stability of the case. This can not twist or twist, no matter how hard you try. Another advantage of the alloy is the matte finish, which is virtually immune to fingerprints. Of course, the kickstand, the hallmark of the Surface series, is also on board again. This can, in contrast to the Surface 3, again completely freely position. That is, you are not bound to fixed angles when setting up and can adjust the kickstand infinitely. The Surface Pro 4 can thus be easily set up anywhere and, in combination with the new TypeCover, which offers a full QWERTY keyboard, once again becomes a competitor for every notebook or ultrabook. The screen of the Microsoft Surface Pro 4 measures 12.3 inches diagonally and comes as usual in the Surface series in the 3: 2 format. For newcomers in the surface area, this may initially look unfamiliar, but when working there are significant benefits. There is more room for content available, in portrait mode, screen content also does not look so bruised. The display is Microsoft's new cracker. Already in the Surface Pro 3 a really good display was installed and not saved on pixels. But the Surface Pro 4 is once again on top, because with its 0.3 inches larger display, the pixel density increases to 267 PPI. This results in a resolution of 2736 x 1824 pixels. The display brightness of the Surface Pro 4 is sufficiently good. Since you like working outdoors with a mobile device like this, this is important. Even in direct sunlight, the contents on the screen can still be seen well. In addition, the brightness can be adjusted continuously via the settings. Thus, it can be set so far down that one does not dazzle the nightly use of the Surface Pro 4 directly from the display. Furthermore, the display is very rich in contrast, which benefits the eye. Texts, videos or pictures just look brilliant, because the color reproduction is very good. All in all, the presentation of the screen content is really outstanding and even a little bit better than its predecessor, where the display, in my opinion, was really awesome. The viewing angles are good to very good because even from a very acute angle, texts can be clearly recognized and do not blur. In connection with the surface pen, the Surface Pro 4 can be used as a digital drawing or notepad, because it has been installed again in the latest generation, a digitizer. This has been revised as well as the pen, so now 1024 pressure levels are available. As a result, the writing on the tablet is improved once again and you can create different weights, solely by the pressing. The press of the screen when writing with the stylus was incidentally getting under control, because thanks to the Gorilla Glass 4, the screen is now so stable that you can not easily create the bruises. The Microsoft Surface Pro 4 is the power tablet bad, depending on the equipment variant, but of course, the performance is different. Our test device is powered by an Intel Core i5-6300U, which offers a clock frequency of 2.4 GHz and can reach up to 3.0 GHz in Turbo Boost. This has enough power to solve office activities satisfying and also brings enough power for more complex work with it. For example, videos can be rendered within a very short time, or even elaborate 3D games can play with them. Of course, the new Intel HD 520 GPU also plays a role, as it takes the upper hand when it comes to computationally expensive graphics. Of course, the eight gigabytes of RAM in our Surface Pro 4 make their contribution. The speaker position has not changed compared to the Surface Pro 3. They continue to sit on the left and right of the display in the upper area. The sound is really good in my opinion so music and videos can be easily listened to without dedicated speakers or headphones. In closed rooms, the volume is sufficient. But once you go outside, where street noise and loud ambient noise comes to it, so the speakers are no longer sufficiently loud enough. Then you tend to grab the headphones rather. The two cameras of the Surface Pro 4 do their job, although they are not among the best recording devices in this technology world. The rear-mounted camera resolves with 8 megapixels and offers an autofocus, which response very quickly. Thanks to the new Windows Camera App, which reminds a little of the Lumia Camera, Microsoft also allows the fine adjustment of white balance, ISO and shutter speed, but also the exposure can be adjusted. 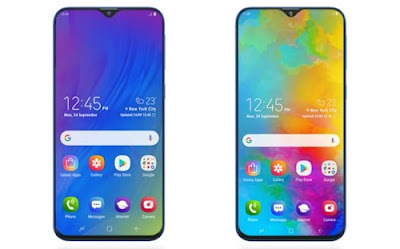 In addition, the new camera app also includes an automatic face recognition feature that moves with the person, meaning that the focus is steadily focused on the face as soon as someone moves in front of the camera. Likewise can be moved with the photo function of the front camera. Again, the above points can be set. The front camera also has a resolution of 8 megapixels and also benefits from the face recognition. I can not really say much about the battery life after a test period of just over a week. I have set up the system similar to my Surface Pro 3 and can say that I can work with it just as long. Of course, it is always hard to break this down to a base, because the usage varies a lot with me from day to day. A Uni day (09: 00-17: 30 clock) I can not do with the Surface Pro 4, without having to reconnect to the socket and although I usually only produce notes with the PDF Annotator and between by a little bit with surf the net in the Microsoft Edge Browser and write one or the other article. However, I have the display generally set to a maximum of 50% brightness (usually so at 30-40%). A running time of 5-6 hours is possible. Of course, that's nothing compared to the promised running time of up to 9 hours. In any case, Microsoft still has to improve! But I can not put up with anything at the end of the game and it does not really bother me. 5-6 hours without electricity are sufficient in my eyes, the much longer I do not stay on the road, without a power outlet is nearby. 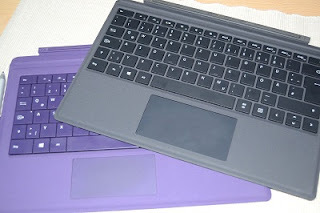 Many blogger colleagues, from other reputed sites, however, complain about the running time, because the Surface Pro 4 does not nearly come close to the 9-hour runtime, but in many cases remains under it. So this does not seem to be an isolated case, but a real problem of the current Surface Pro. Compared to the Surface Pro 3, however, one has to admit that a slightly larger display naturally requires more power, so the advantage of the Skylake processor is probably put into perspective by the additional consumption of the display. I would say smooth 8 hours at a time are in there and that is a complete working day. This is still a good value for such a well-equipped tablet, in my opinion. Incidentally, the Surface Pro 4 is charged via the same connector as on the Surface Pro 3. It latches magnetically into the power port and provides the tablet with the necessary power to carry out high-performance applications. The Microsoft Surface Pro 4 is a really consistent successor to the, with me beloved Surface Pro 3. Microsoft has improved many things that are in need of improvement. So they have raised the stylus again to a new level. The writing is even better by the hand and has become even better due to the 1024 pressure levels. Also on the TypeCover Microsoft has eradicated the critical points, such as the somewhat small touchpad and the missing "print" button and delivers with the new TypeCover a really very good keyboard. The Surface Pro 4 convinces with its great performance. In addition, it has become thinner and lighter, which brings a great advantage on the road. Even the larger display, with the same external dimensions, gives the impression that the Surface Pro 4 has simply become slightly more compact again. Furthermore, the display is a force, the content looks brilliant and colorful. Working on the go is also no problem thanks to the display brightness because even when the sun shines directly on the display, you can still work comfortably. Only in the battery life, Microsoft has to do something again, I really hope that a software update gets the problem under control. For newcomers to the Surface family, I pronounce a clear buy recommendation, a better Windows Tablet you will not find in the market. Microsoft once again raised the bar for the OEMs. The Microsoft Surface Pro 4 is state of the art. Anyone who already owns a Surface Pro 3, does not want to spend so much money and still wants to enjoy a few of the benefits of the new Surface, is just about to resort to the new stylus and TypeCover. Because the larger and improved touchpad in combination with the new stylus also makes the old surface a slightly better device. The pen can be used as a pencil and also offers interchangeable tips. Only the improved pressure levels must be omitted here.